bbpx-x1 , bbpx-y1, bbpx-x2,bbpx-y2 (combined in one row as [39 , 116, 569, 375]. extract necessary fields values from .mat combining coordinates. Sorry, Luna, could you help me with one more thing, please. How can I Convert cell array to table? I tried to use C = cell2table(outPutCellArray); but it doesnt give result with coordinates in one column. You can get the results of your desired column with below syntax for tables. tableName.Properties % shows the properties of the table such as VariableNames, Description, RowNames,etc. 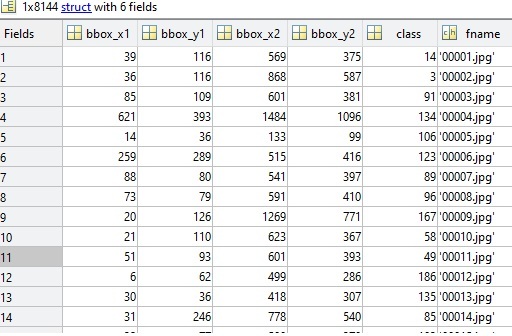 C.object_bbox2 % this will give you the entire second column of your table which is 8144x4 double array. C.object_bbox1 % this will give you 8144x1 cell array filled with names of your jpg files. Sorry, maybe I didnt clearly explained my problem. I am working with function that requirs values stored in Table. I really don't get what you mean by [39 , 116, 569, 375] and [39 116 569 375]. Because those are the same things 1x4 double arrays. If you want them as string array with commas it will be a different thing. 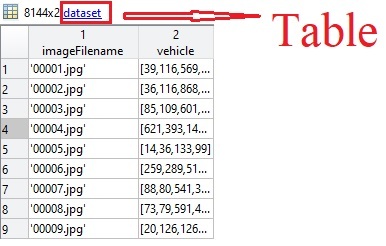 Btw, you are asking for a table but showing a dataset example in your variables window. These are also different things too. into the Table, so that (bbox_x1,bbox_y1,bbox_x2,bbox_y2) is string array with commas.